While dealing with IntelliTrace, sometime you must have noticed there are so many event capture by the IntelliTrace. You can filter them out by selecting categories from IntelliTrace Window which will minimize the number of events captured. 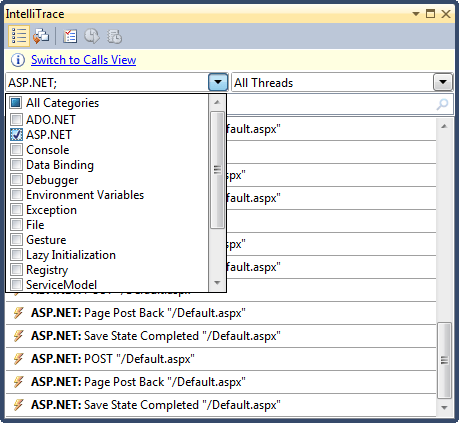 As shown in below image, I have filtered the records on “ASP.NET” Categories,hence it’s displaying all the ASP.NET Related events. But what if, if you want to search for some specific information with in the list of events ? 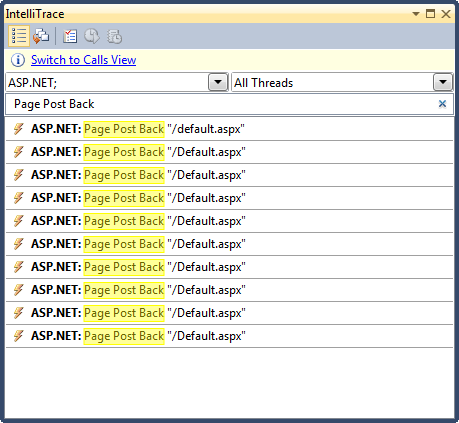 Let’s say you have categorized the items for ASP.NET only, then you want to see all the event related with “Page Post Back”. Well, in IntelliTrace window you have an option for filter the properties. So type “Page Post Back” and press “Enter” you will get list of all the events which are related with “Page Post Back” . Hope this small tips will help you !